Agile has gained a significant track and has been adopted by all organizations. Agile Methodology today has become one of the most popular and most dynamic project management styles among the software development teams. And Agile is also being adopted by various other functions. It is important to note that Agile can be applied to many types of teams and projects and should not be thought of as limited to engineers or software development projects only. We run all our software delivery through an Agile methodology called Scrum. Scrum is well-recognized amongst engineering teams, but a variety of teams across industries have come to love the Scrum way. From manufacturing to operations and education, businesses of all kinds have used Scrum practices and successfully. As long as your projects involve a concrete product, Scrum can work for you. We have been using Scrum for the last few years and have some great success with it. But, still, the Team come across various common Scrum Pitfalls. Many organizations are adopting Agile and Scrum for producing higher quality products and services. Organizations are hiring Scrum Masters for implementing Scrum Framework. It’s the sole responsibility of a Scrum Master to make sure it’s fully implemented and followed by the team in an organization. The Scrum Master is a champion for a Scrum team. He coaches the team, the product owner, and the business. The Scrum Master is a multitasker were deeply understands the work being done by the team, motivates the team and makes sure that the teams are following the Scrum processes and will also work together with them to continuously improve them. How important is a Scrum Master? Scrum Master also ranks on the top of the hierarchy on most of the Agile or Scrum Process, with an eye towards a better understanding of role and importance, here is a closer look at the Scrum Master roles. 1. Scrum Master plays a vital role in the success of the project, he serves as a glue that can hold the entire project. 2. Scrum Master may not participate in daily Scrum meetings but supports the entire team. 5. Scrum Master aims to deliver the maximum value to the customer. Many organizations, as well as the upper management, confuses the role of the Scrum Master with a Project Manager. However, the most important thing that we all should know is that the Scrum Master is a Scrum facilitator for a team as well as an organization. However, sometimes management expectations are different, which makes the life of a Scrum Master little harder. We all need to understand that Scrum Master is a facilitator, a guide, a process follower and most importantly, a Servant Leader. As per Mike Cohn, it is the social aspect of change that can create resistance, all resistance comes from specific individuals. Teams or departments do not resist changing to Scrum, Individuals do. So, when we talk about Scrum implementations, the Scrum Master is the change agent for the same. It’s a major hurdle faced by a Scrum Master during the implementation. Change Resistance is not a surprise, it’s the most expected reaction whenever a new change is introduced. Tip: Choose a length of the Sprints in such a way that it can resist change. There are many ways of adopting Scrum patterns and overcoming change resistance. You will get that Scrum adopting patterns in my previous article- Patterns For Adopting & Spreading Scrum In Organizations. When we talk about implementing Sprints, every event is supposed to be time-boxed in order to get productive results. For example, the Daily Scrum event should not exceed 15 minutes, but in reality, we see team members start discussing their technical difficulties and the meeting goes longer than the allotted time. It’s one of the most common challenges for any Scrum Master. Well, a funny thing to try to overcome this hurdle is to make the team members stand for 15 minutes. Hide all the chairs! They will eventually get tired and finish up the meeting. Scrum Masters follow the rule when implementing Scrum which is to never accept changes within the Sprint. We can handle the change requests at the end of the sprint or at the start of the Sprint but not in between. However, in a practical world, we see Product Owners/Customers/Stakeholders coming up with an urgent change requests or bugs. However, it’s also not good to blindly follow the process without understanding the business and market aspects. It’s always better to communicate, collaborate with all the Stakeholders, replan and then make good decisions. It is one of the most common barriers faced by a Scrum Master. 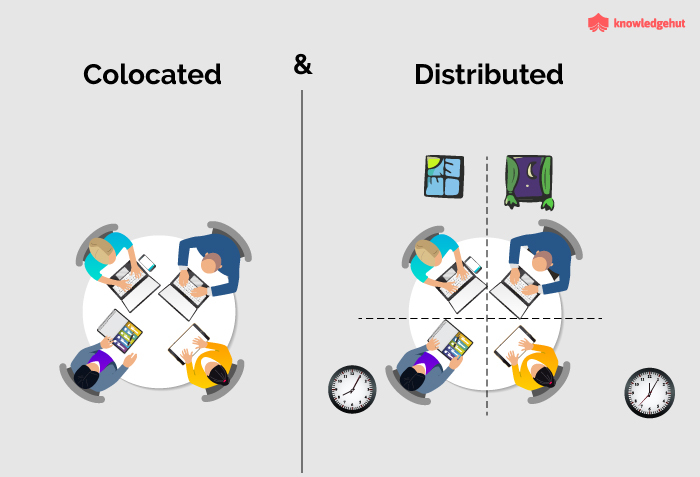 When the teams are distributed geographically, there are sometimes delays, network issues, cultural or regional issues, different Time Zones, different working hours, it is always difficult to get everyone connected and collaborate/communicate with everyone. Thanks to all the technologies, applications out there that help us overcome this hurdle whether it’s communication, video conferencing, there are many tools available. Basically, Scrum Master tasks start with booking meetings, scheduling events, taking notes, and inviting people to ceremonies. All these may be the primary function of the Scrum Master and these deals with making the team be effective. The tasks involve various challenges. As the Scrum Master is meant for the team, it’s a responsibility to make sure all your team members have foundational Agile training. This is one of the most problem faced by Scrum Master. 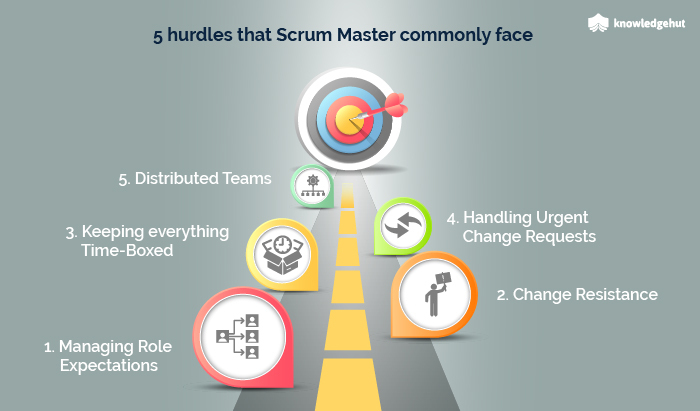 To summarize, I would say, these are the just the “Hurdles” commonly faced by Scrum Masters but not the “Blockages”. These obstacles can be jumped over, with good skills, expertise and, experience in Scrum implementations. Keep Learning!